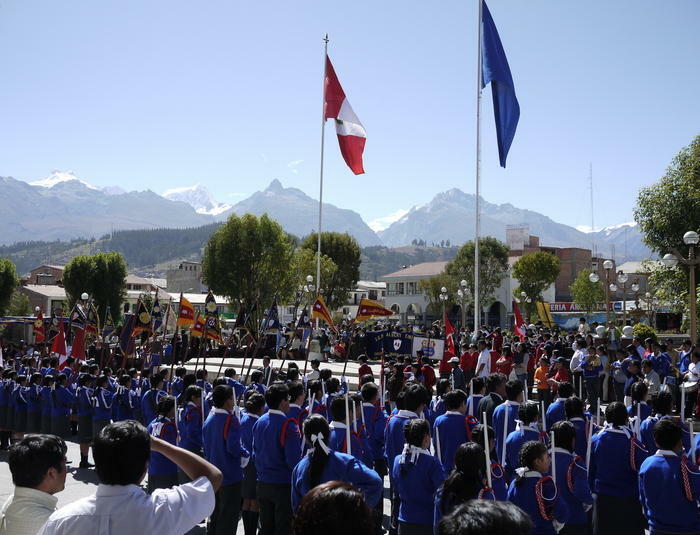 Photo and travel journals from a month-long trip to Huaraz, Peru in June 2010, including adventures and trekking in the Cordillera Blanca and Cordillera Huayhuash. On a cold and windy evening the last rays of sunlight beam through the clouds to illuminate Ausangate, Peru. Posted in Andes, Backpacking & Trekking and tagged Peru on June 30, 2018 July 1, 2018 by Jack Brauer. 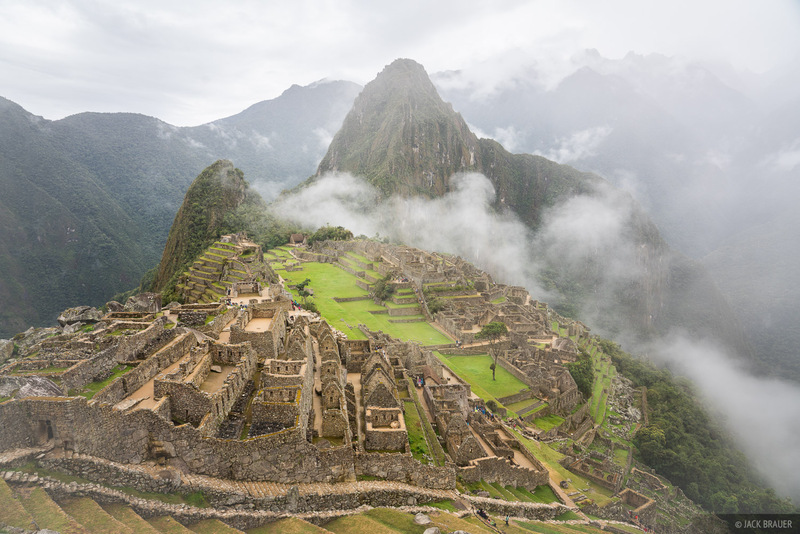 Misty clouds in Macchu Picchu, Peru. Posted in Andes, Backpacking & Trekking and tagged Peru on June 25, 2018 by Jack Brauer. 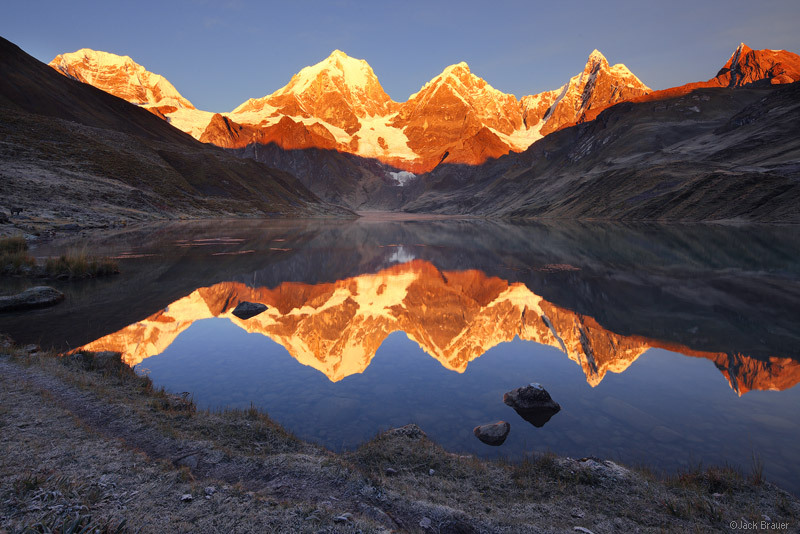 Brilliant sunrise alpenglow on the tallest peaks of the Cordillera Huayhuash (Yerupaja, Yerupaja Chico, and Jirishanca), reflected in Laguna Carhuacocha - June. Here are a few photos “from the vault”, from my trip to Peru a year ago. 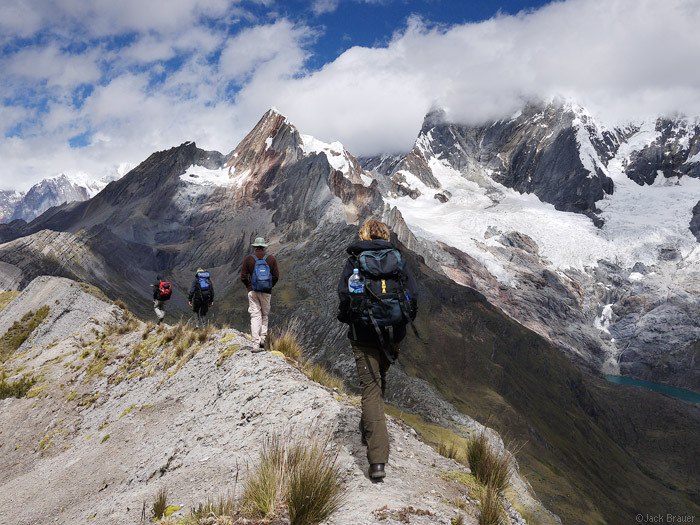 Both were taken along our trek around the Cordillera Huayhuash. One of my favorite shots from the trek was from this same spot but at sunset. Because I liked that one better, with its softer, calmer light and clouds, I never posted this version from sunrise. But this one definitely has some pop, eh? 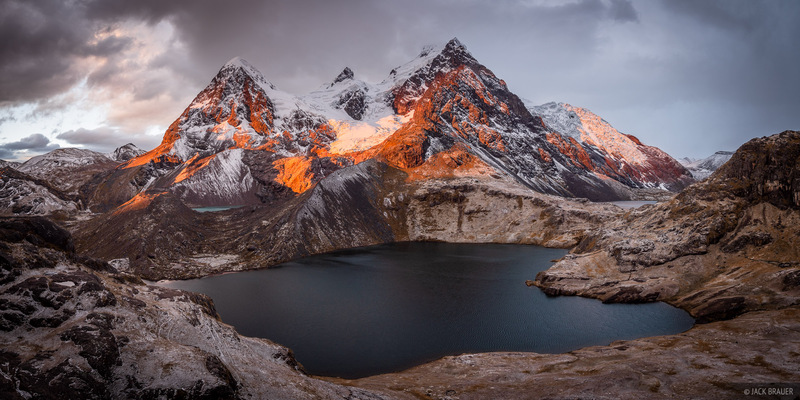 A panoramic view of the Cordillera Huayhuash around Yerupaja (6617m, 21,709 ft.), the second tallest mountain in Peru. Jirishanca (6094m) is towards the left side. June 2010. 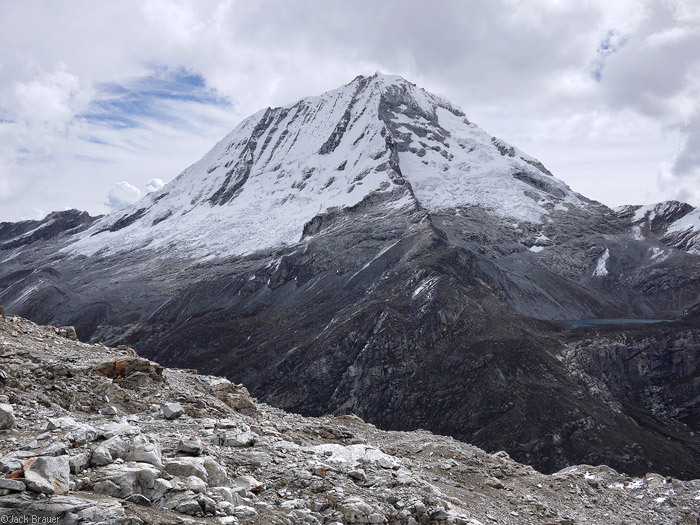 I took this panorama during one of the more spectacular bits of hiking during the 11-day trek. That day we came from over a pass off the right side of the photo, but instead of taking the standard trail down through the valley, we hiked along this high ridgeline, with a huge views of the mountain range the whole way. We ended up at a lake down in the valley on the left side of the photo, under impressive peak of Jirishanca. My spontaneous three week trip to Peru last June ended up being a wonderful decision, not the least because I met my girlfriend Claudia on this trek! I would have never guessed before this that I’d soon be spending six months in the Alps to be with her. And she arrives to Colorado on Monday!!! So thank you, Peru! Posted in Andes, From the Vault and tagged Andes, Peru on June 25, 2011 May 19, 2013 by Jack Brauer. 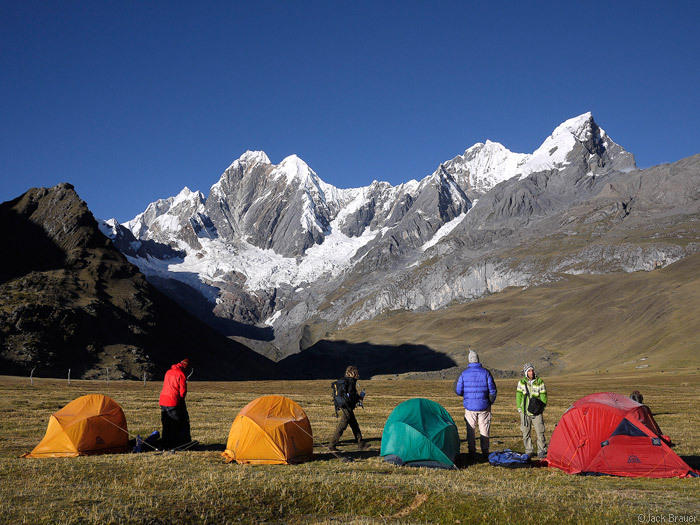 After our big Cordillera Huayhuash trek, followed by a rest day in Huaraz, four of us headed out into the Cordillera Blanca near Huaraz for a three day hike up the Quilcayhuanca valley, over a high pass, and down the Cojup valley. This time we would not have burros to carry our gear for us! 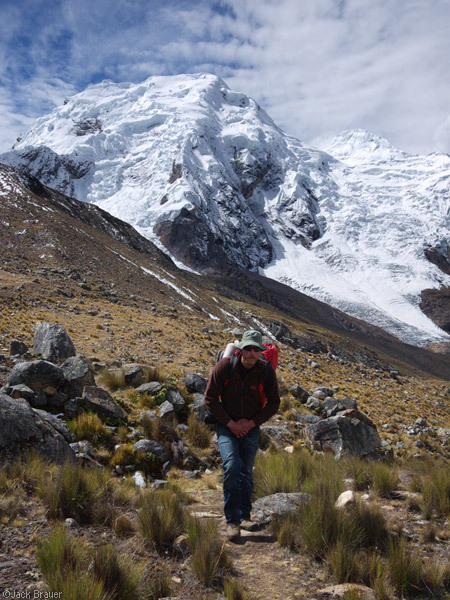 Also unlike the Huayhuash trek, we would have some challenging weather this time. It rained for the last several hours of our hike in towards Laguna Tullpacocha, and we got a bit off track from the “trail”. But we found a nice hidden campsite and managed to get a good bonfire going despite the wet wood. Once the clouds cleared that evening, the glaciated peaks surrounding us shone in the bright moonlight, and we slept under the stars that night (along with a local cow who had been trying to enjoy our campfire with us). The next day we had to hike over a ~5100m (16,732 ft.) pass. Turns out that this is much harder to do without burros carrying half your stuff. But Erik was still stylin in his city jeans, with Nevado Pucaranra behind (6156m). Claudia keeps going. In the background is (I believe) Nevado San Juan (5843m). From the top of the pass, the view of the massive Nevado Ranrapalca (6162m, 20,217 ft.) was impressive. Notice how easy it is to see how the glaciers have recently receded. Just as we got down off the pass and arrived in the Cojup valley, the clouds unleashed with pelting hail. We set up our camp and made dinner in the freezing cold. Nevado Palcaraju (6110m) shines in the moonlight during a break in the clouds. Notice the huge glacial moraines in the center of the valley below the glaciers. After a lazy morning start, and a somewhat confused hike out the valley, we were eventually all back in Huaraz again that night to celebrate with fine Peruvian wine and food! 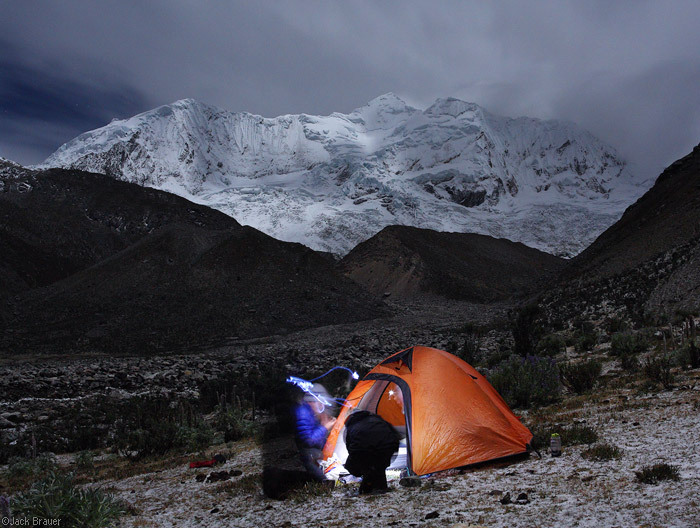 Posted in Andes, Backpacking & Trekking and tagged Andes, Peru on June 30, 2010 May 19, 2013 by Jack Brauer. 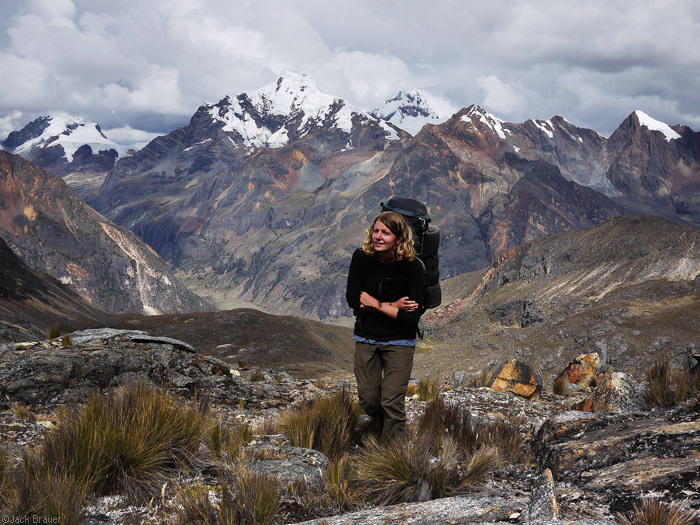 A few weeks ago I fulfilled one of my dreams – to trek around the remote and rugged Cordillera Huayhuash mountain range in Peru. In the city of Huaraz, the base for most of the expeditions in the Cordillera Blanca and Huayhuash, I signed on to a 10 day trek with burros to carry all our camping gear, an arriero (burro driver), a guide, and a cook for all our meals! Deluxe! Not only that, but our random assortment of people turned out to be a good group and we all had a great time together. Below are a bunch of snapshots from the trek, in chronological order. 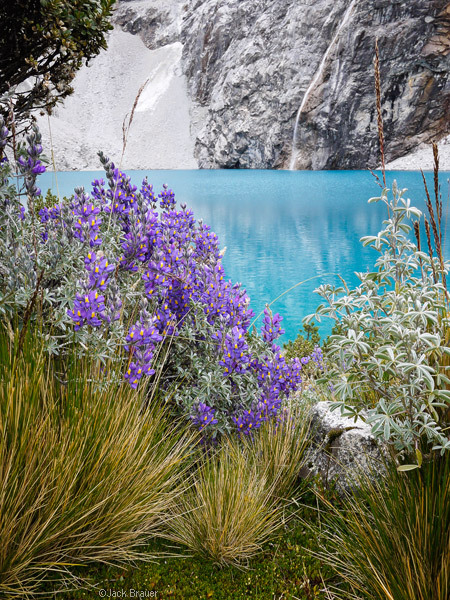 You can also see my gallery of landscape photos from the Huayhuash here. 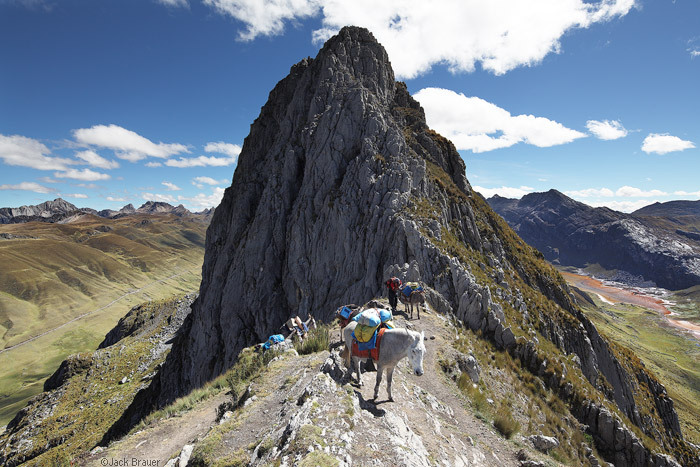 An arriero guides his burros over our first pass in the Cordillera Huayhash. Hiking a beautiful knife ridge with a spectacular view of Jirishanca. Lots more photos below the fold… don’t miss it! 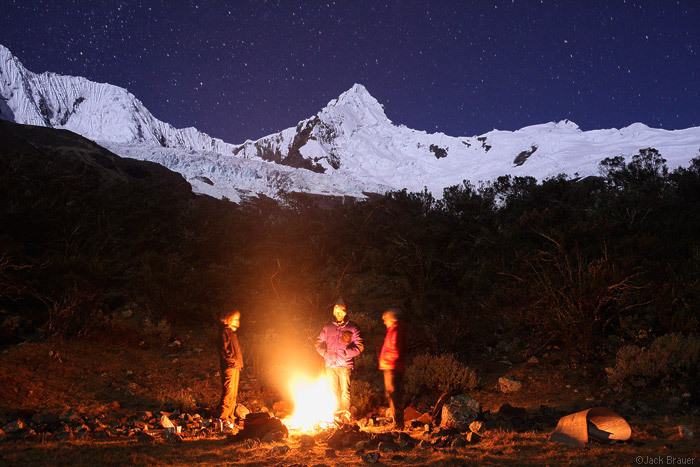 Posted in Andes, Backpacking & Trekking and tagged Andes, Peru on June 29, 2010 November 21, 2013 by Jack Brauer. I am back home after my 3 week trip to Peru! Due to the huge amount of photos I took, I did not have time to post all my blog entries while I was down there, so I am going to post them in a belated fashion over the next week or so. The first one here is from a day trip to Laguna 69, a beautiful alpine lake at ~4600m elevation (~15,000 feet) in the Cordillera Blanca. Unfortunately most of our views of the high peaks that day were obscured by clouds; however, they parted for just long enough for me to snap this photo of (I think?) 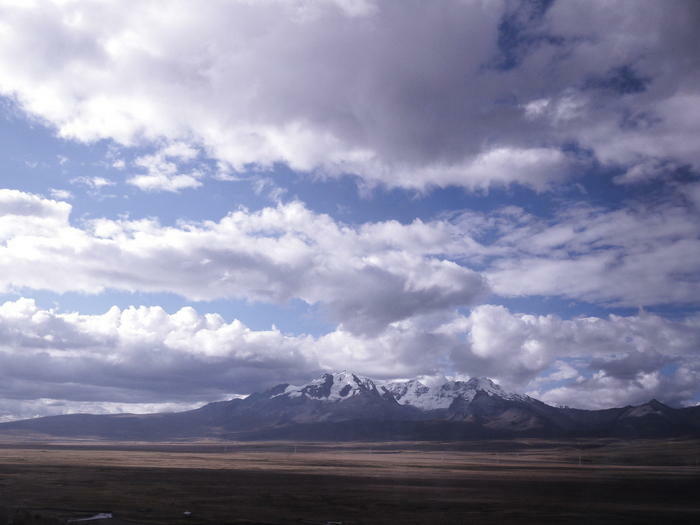 Nevado Chacraraju (6112m, 20,052 ft). Laguna 69, looking like a slice of paradise in a harsh, icy environment. Posted in Andes and tagged Andes, Peru on June 25, 2010 May 19, 2013 by Jack Brauer. I’ve been on quite a nomadic streak lately. With only a few work projects in the queue, and with the dirty Colorado snowpack rendering spring snowboarding and mountain photography fairly useless, I was feeling antsy and decided that my month of June would best be spent elsewhere. So several days ago I spontaneously booked tickets to Lima, Peru! A delayed flight from Montrose, followed by a mad dash through the entire Houston airport, got me to the Lima flight just in time for the final boarding call. After spending a night at a hostel near the Lima airport, I enjoyed a wild ride in a taxi to attempt a 45 minute ride to the bus station in 30 minutes through traffic. My first lesson in Peru: the driving is absolutely nuts. Traffic lanes and stop signs are mere suggestions. My cab driver was an undiscovered NASCAR champion (who knows how many of them there are in Peru). He probably cut off 30 different cars during the race, including several large buses. We got to the station 10 minutes late, but I was still able to jump on board just before the bus pulled away! Not only that, but I scored a front seat on the top deck, enjoying a panoramic vista for the entire scenic 8 hour drive to Huaraz! (The picture above was taken from my seat on the bus). Now I am finally relaxing in Huaraz, at the foot of the mighty Cordillera Blanca, which is plump full of 20,000+ foot glaciated peaks (though they may not be glaciated much longer, unfortunately). The picture above is of some kind of big ceremony in the Plaza de Armas. Notice the huge Himalaya-esque snowcapped peaks looming in the background. Though fairly exhausted from the two days of traveling to get here, I didn’t get much sleep last night, since my hotel room happened to be on the other side of the wall of some kind of nightclub where an energetic and likely coca-leaf-chomping Peruvian band played for a full 10 HOURS STRAIGHT, from 8pm to 6am. They started out great, but by about 3am the music had devolved into a mind-numbing mishmash of lumbering two-note bass, frantic off-key organ keyboard, ceaseless vocals, and excessive cowbell. Though thoroughly annoyed and desperate for sleep, I couldn’t be too mad since the whole situation was such a classic gringo cliche. Needless to say I’m staying at a different place tonight. 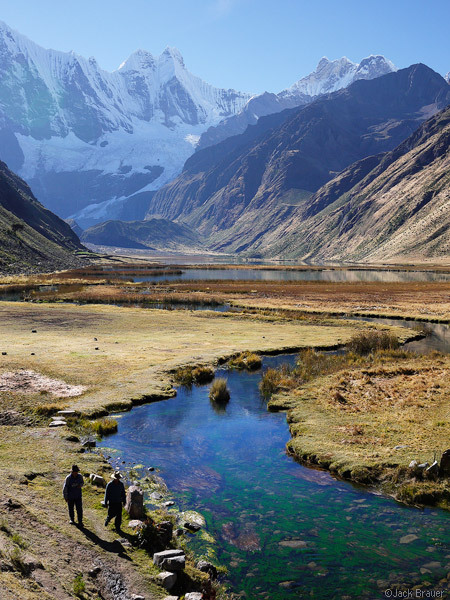 Tomorrow I’m going on a day trip to a lake in a high glaciated cirque, then on Monday I am headed out on a 10-day trek around the Cordillera Huayhuash, another high rugged range south of here. I will join a group of 4 or 5 other people, and we’ll have the full deluxe support of burros to carry our gear and a cook to prepare meals! After that, 5 or so more days to do another shorter trek in the Cordillera Blanca, probably based from the smaller, more mellow town of Caraz. 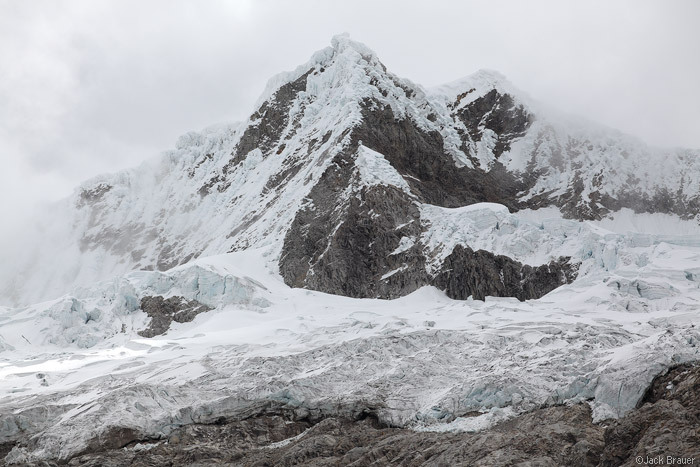 Posted in Andes and tagged Andes, Peru on June 5, 2010 May 19, 2013 by Jack Brauer.